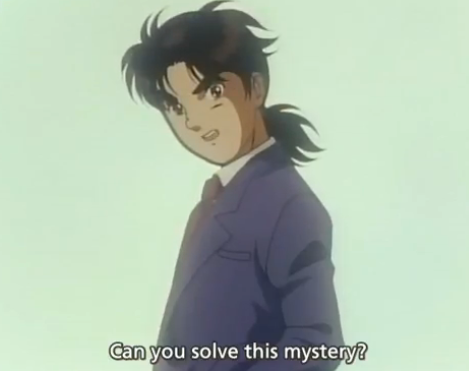 Even if *you* can't solve it, Kindaichi sure as hell can. This post is a quick look at Kindaichi Shounen no Jikenbo (The Case files of young Kindaichi), based on a viewing of only the first three episodes. Hajime Kindaichi is a high school student with a knack for solving mysteries, furthermore, people seem to get killed wherever he goes. Yeah, you know the type. Kindaichi will feel familiar to those who watch Case Closed, or have seen an American mystery series, such as Murder She Wrote. In my case, I went through a phase of reading Ellery Queen stories as a kid, so I find these who-dunnit series comfortable, if not addictive. These three episodes were originally broadcast in 1997, and the art style (delivered by Toei Animation) really has that old school feel to it. To compare it to Case Closed, it is much darker, and lacks the various fanciful elements (e.g. the high-tech sneaker, and the large cast of comic characters). Instead Kindaichi supplements the mystery with added suspense (pseudo-horror). In this way, a modern parallel might be When They Cry, although the plot in Kindaichi is more linear. The three episodes form a complete “case”, which draws on the convention of the unexplained phenomena that seem to be associated with any self-respecting Japanese school. In this case a mysterious figure is killing those who investigate the secrets associated with the old school building. Just to be clear, based only upon the first three episodes, there is violence, death, and blood, but nothing as gruesome as can be seen on occasion in When they Cry. Whereas three episodes (a single case) isn’t enough to make a decision about an entire series (which ran in excess of 100 episodes, and several additional movies), I would say that the solution to the mystery was surprising, without being completely unfair; that is, the most of Kindaichi’s deduction could have been made by a sufficiently observant viewer of the anime. I consider fairness an important criteria for a show such as this that features “locked rooms”, and so forth, because one of the attractions is the battle of wits, not only between the criminal and the detective, but also between the detective and the show’s audience. Kindaichi Shounen no Jikenbo is a show I would like to give another chance to, to see how one case compares to another. For fans of the Mystery genre, I would recommend giving it a try. If you have always hated such shows, I didn’t see anything to believe this was the show that would change your mind. I have included this in my watchlist because I love detective shows. A lot of plot was unfortunately cut out of many early cases because they had been made into drama already. Interesting comment. I haven’t had time to double back on this title, but I’m thinking about doing it, because I haven’t seen a good mystery in a while.